Entries categorized "Greater Richmond Challenge"
For two days in May, diverse teams of Richmond region residents fan out to explore key issues facing our community -- education, affordable housing, transportation, crime and safety. In addition to meeting, interacting and developing relationships with fellow residents, participants are exposed to some of the key solution builders in our community. In 2006, I received the education of a lifetime about the challenges faced by lower and middle income families in their quest for affordable housing (both those looking to rent and to own). And I walked away inspired beyond belief by the work of the Better Housing Coalition and other area organizations. I also walked away with a handful of new friends -- most of whom remain friends today. In 2007, my disinterest in secondary education was challenged when my team set forth to explore how Richmond, Chesterfield, Henrico and Hanover are dealing with the challenges of educating our youngest citizens. I was impressed with the commitment demonstrated by school administrators in Hanover, and blown away by the passion and energy of the principal of Woodville Elementary School in Church Hill -- Mrs. Taylor needs to be cloned and distributed nationwide. Once again, I ended the challenge with new friends and acquaintances. The pending birth of our first child is keeping Nikole and I from participating in the Greater Richmond Challenge this year, but I'll be cheering from the sidelines as another 100 residents set forth to learn more about our community, about each other and about themselves. All told, I'd guestimate that this session drew 500 people, give or take. I ran into Elaine S. there, so we sat together and I tried not to make catty remarks. I also bumped into Mary R. and a few other friends and acquaintances. One nice thing is that while a lot of the usual suspects were in the room -- VCU's Gene Trani, the GRCC folks -- the bulk of the participants in this process were only vaguely familiar or total strangers. Because I showed up at that event, I took interest in a follow-up event the Chamber initiated in 2006. Participating in the 2006 Greater Richmond Challenge introduced me to some of the coolest community-minded people in town -- You can strike Bill Pantele from my original "business crush" list; someone warned me way back when about his sweet-talking ways. I didn't listen. -- and ultimately engaged my own civic spirit, which had been sitting on the sidelines throwing cynical jabs for far too many years. The Richmond Challenge got me engaged around the topic of affordable housing -- which led me to help on a Habitat for Humanity build; speak at several public events around town on the topic; and introduced me to more cool people. The same thing happened when I participated in the second Greater Richmond Challenge this past May. My too-brief experience at Woodville Elementary School in Richmond's East End was an eye-opener in many ways, both positive and negative. This year, I've been working on the planning committee for the third annual Greater Richmond Challenge (with its sassy subtitle of "A Civic Adventure") and am extremely excited about the changes we're planning to make the third Challenge more interactive, more engaging and less predictable than the last two (which we pretty interactive and engaging, and not too predictable to being with). The two-day event will be held in May at locations throughout Richmond, Chesterfield, Henrico and Hanover and will cover a range of regional topics (which we're still trying to pin down -- I'm in favor of including topics beyond the usual suspects of crime, education, transportation and the like) by sending teams of people out into the community to learn about the challenges of and solutions to specific issues. In addition to the possibility of additional topics, we're also dramatically changing the team structure to maximize opportunities to build relationships with other participants and to allow participants to go deeper into a specific topic area. Outside of turning the design upside down to create what I hope will be a better Challenge, I also have a lot of passion about diversifying the experience. For a lot of reasons, the first two Challenge events were somewhere in the neighborhood of 80-90% white. The Chamber organizers are committed to a different experience this time around, and I have foolishly signed up to help change the recruitment demographics. I say foolishly only because it will take some serious work to get the message out beyond the traditional media channels; after watching the City of Richmond struggle to attract a diverse audience to the Downtown Plan process, I'm all about opening the door wider for future community conversations. 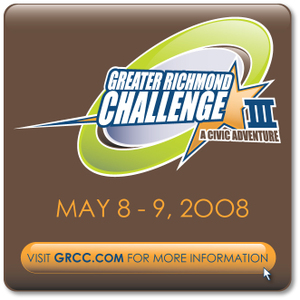 Find out more about the third Greater Richmond Challenge, or read up on the 2007 and 2006 versions. After two days of beating the streets of the Richmond region with the Greater Richmond Challenge, looking at programs that make a difference in the arena of education, most of our 15-person team made individual commitments -- to mentoring in schools, to sharing what we learned, to engaging in their own child's school. This week, most of our team agreed to spend the next six months working with Leadership Metro Richmond to explore ways to extend our work as a group, and to make more of a difference in the region. Our first post-Challenge team meeting is slated for June 11. I spent a lot of ink earlier posting some thoughts and observations from a handful of educational organizations as part of the Greater Richmond Challenge II, and saved the most inspirational for last. Our visit to Woodville Elementary School in Richmond's East End came on the heels of a rather insipid presentation in Chesterfield County. Woodville was a blast of fresh air, and a window into a world to which most members of my team rarely ventured. Woodville houses more than 600 students, and as a Title I school is required to maintain class sizes of 15-20 students. As a result, the school is cramped for classroom space -- especially with its Head Start and VPS classes. More than 90% of the students are eligible for free lunch, and four years ago Woodville's third grade SOL scores were in the cellar. Enter Principal Rosalind Taylor and the Micah Initiative at St. Paul's Episcopal Church. Woodville's third grade SOL scores were in the upper 90s last year. Its halls are clean, colorful and interactive -- little learning lessons hang at eye level to the students, along with student artwork. The kids at Woodville make eye contact, smile and respond to questions (albeit a little shyly). And the library is apparently a major turnaround in itself. The library is where our team met Mrs. Taylor -- along with school superintendent Deborah Jewell-Sherman, School Board member Betsy Carr, and Buford Scott, one of the driving forces behind the Micah Initiative. On the way to the library, we met both assistant vice principals, the head custodian, the library media specialist and a handful of students and teachers. More on the library in a moment. Jewell-Sherman spoke first, providing some background on the school's relationship with St. Paul's Church. We have many students in Richmond schools whose parents are able to provide, who recognize the importance of education, and we are able to provide these students with an excellent education. And we have a large percentage of students in Richmond who are not so fortunate. They start so much further behind the starting line. We are so fortunate to have many wonderful community partners like St. Paul's Micah Initiative and its 100 volunteer mentors. Their participation in our schools and their advocacy makes all the difference. In 2002, we had five schools that were fully accredited by the state. We've gone from 10% to 90% of our schools being fully accredited. It has been a function of leadership, partnership and will. As I'm transcribing, I realize that Jewell-Sherman's comments sound like so many talking points, but at the time I was drawn in by her conviction and obvious passion. I was drawn in even further when the only 70-year-old man in pinstripes and a bow-tie in the room began speaking. Buford Scott is one man who could have turned his back on Church Hill's poor, minority community easily. That he chose to invest himself into the lives of Woodville's children amazes me -- and raises the question of why there aren't more Buford Scott's in the world, or why we don't hear about them. Nine years ago, St. Paul's decided that instead of spreading our money around in small amounts without ever knowing if it makes a difference, we'd work closely with a small number of organizations. When we chose to work with Woodville Elementary, the first thing we did was say, "You tell us what we can do to help," and we started to build trust. Our dream is to have a Micah-type program at 26 schools in Richmond with 15,000 mentors serving the students. We know mentoring works. We know mentoring makes a difference. One of the questions that brings a tear to my eye -- all a little child wants to know is whether or not their mentor is going to come back the next week. A little boy asked, "Will I ever see Mrs. Lucy again?" That is the heart of the matter for many of these children. They are very used to seeing adults enter and leave their world -- parents, siblings, neighbors, of course. But also adult volunteers, teachers and mentors -- who pop in once or twice, and then vanish. Permanency is not a common aspect of relationships for many of these kids. It's something that St. Paul's mentors know and work to avoid. I almost started crying when Rosalind Taylor started speaking -- something about her presence, drive and visible compassion for helping children learn struck me. And her description of the children who enter her school, and her passion for helping them beat the odds, was powerful. Our children suffer from the ills of poverty. They come here with a lot of needs. But in the meantime, I tell them, we have to learn! These children come with their pants hanging to their knees. I have rope in my office, I tell them. You will look like Huck Finn before you'll walk around here with your pants sagging. A PowerPoint shows the stats -- the number of students, the demographics, the falling and rising SOL scores. As she walks through the numbers, Taylor tells the stories. The story of the young teacher whose students were falling behind -- she asked the other teachers to take the students into their classrooms, and paired the new teacher with one of her seasoned faculty. The gossip started that the new teacher was being punished. Mrs. Taylor pulled her teachers together and set the story straight. The new teacher needed to learn how to manage the emotional chaos children from stressed communities bring with them into school, Mrs. Taylor reminded her staff, and it was their job, as a team, to help her learn. The story of two twins who attended Woodville, and the day she discovered that they had moved with their mother to Southside Richmond. Law prohibits children from attending schools out of their district, but every day the mother took her two children across town on a GRTC bus, waited with them at a bus stop and sent them off to Woodville. When Mrs. Taylor was discussing the matter, one of the children burst out, "Mrs. Taylor! Please don't make me leave Woodville! It's my third school this year." The story of children who sleep in bath tubs to avoid flying bullets. Children whose socialization skills are low. Children filled with rage, a result of their environment. Children who don't get breakfast at home, or dinner. Where are you doing after Woodville, I ask them. Middle school! And where after middle school? High school, they say. And where after high school? College! And where are you going after college? To get a job! It sound almost trite until you stop and realize that Mrs. Taylor and her team of teachers are the first people to plant these seeds in the minds of these young children. It's my goal to provide the opportunities to get these children there. We use our partners without shame. They know I will ask them for the moon, and that I would ask them for the sun, if I could. Which lead us to the library. Mr. Scott said, "Deborah, I want to talk to you about that media specialist you have at Woodville..."
"That media specialist" was running a library empty of books. Boxes of magazines from the 1950s were collecting dust. The windows were dirty. There were no computers. It was, by all accounts, the last place you'd go to discover a love for reading. My dream is to have a state-of-the-art building. My children deserve the best. So, what did the Greater Richmond Challenge teach me about the educational challenges and successes in the Richmond region? Quite a bit. I've posted quite a bit over the past year about my exeriences with the Greater Richmond Challenge -- most recently a snapshot of some of the inspiring people I met; an overview of the Times-Dispatch's coverage of the event; and a high-level glimpse at some things I learned about Richmond's school system. What I really learned, though, is that there are thousands of amazingly passionate people -- educators, parents, administrators and business people -- who are utterly committed to the children in the Richmond region. I also learned that there are vast differences between where, for instance, Chesterfield and Richmond are able to focus their energies. I wanted to capture some of what my team heard and learned during our tour of the region. I have to admit that I headed to Hanover County with a real bias. Hanover is rich, white and often seems dedicated almost exclusively to keeping things that way. Peggy Harrelson, who heads the county's Head Start program, and school superintendent Stewart Roberson, changed my perspective. Not my perspective about the county's demographics -- those are real enough. But Harrelson and Roberson came across as genuine, down-to-earth and honestly committed to the children in their county, regardless of the child's circumstances. Let me take a family we served several years ago who immigrated from Kenya. When they arrived in Hanover, there was one child with a second on the way. Moving to a new country with little command of the language is a struggle for anyone -- this mother somehow found her way to Head Start and we enrolled her older child. The mother began to access of all the county's social services in the most appropriate way -- when she didn't need a service anymore, she stopped using it. The oldest child is entering high school next year on the Honor Roll. The mother, who was a professional in Kenya, got very involved volunteering for Head Start. She began to pursue a degree in childhood education and got a full scholarship to Randolph-Macon, and plans to teach in Hanover. What Harrelson went on to share is the importance of parental involvement -- both for the success of the child, and for the success of the program's designed to support early childhood education. ... One of the biggest single factors in a child's ability to read is being read to as a child. Superintendent Roberson was extremely candid in his views about regional efforts around early childhood education, and wasn't shy with his firm belief that public education was the answer -- not privatization. The perfect response for the Richmond region as it relates to early childhood education starts with our public schools. I read articles in our local papers and see divergent views on the best approach to early childhood education, and am struck that some people question whether the public schools have a role. In Hanover, we want to do things 'well,' not 'swell.' I believe the region can achieve substantive goals if we bring lots of people to the table and let them talk through the issues. In a perfect world, I would want everyone to acknowledge that our public schools have a critical role in creating the best educational programs. Unfortunately, early childhood education tends to be a flash point for political reasons. I think that there is a subtle change going on in the environment that is very subtle. For the first time, I have heard the national director of Head Start say publicly that if we want to continue to exist, we need to collaborate. I hear our governor saying the same thing about early childhood education. Our second stop was in Glen Allen at Bon Secours' Commonwealth Parenting, which was started in 1984 by three mothers who realized that wasn't a parenting resource that focused on how to be an effective parent. And while Commonwealth Parenting is decidedly geared toward upper middle class parents, it provides something of a model for teaching good parenting that deserves to be replicated more widely in our community. We change the world one family at a time -- from parenting reactively to parenting with skills. We are creating a legacy that goes on generation after generation. We see the most success with parents who really embrace the new challenges and growth that come as their children age. The third grade year is so significant for children. It takes the whole community to pull together. Our agency works with preschools to help students learn, and I've seen a huge growth in Richmond of non-profits who are eager to get past the turf wars. As my child has attended the public school system, one thing I've discovered is that my frustrations as a parent are the same as those of the school officials and educators. Chesterfield is where my predisposed bias played out, though my suspicion is that I can blame the county's public relations machine for that. The county seems too reluctant to drop the veil for a bunch of loose cannons who may see blemishes -- and the backlash is that those potential critics don't have an opportunity to be cheerleaders. Our visit to Chesterfield involved a dense, programmatic PowerPoint presentation by the county's elementary language arts director. It was difficult to find a beating heart beneath the impressively structured presentation -- and as a graduate of Chesterfield schools who has a mother-in-law who has dedicated much of her life to counseling elementary and middle school children in the county, that proved a disappointment. I suspect if we had an opportunity to sit down with any third-grade teacher in the county, we would have walked away filled with excitement about the work being done for the county's children. Unfortunately, the clinical presentation we received felt like spin -- spin a county as successful as Chesterfield shouldn't have to present. Richmond's best-kept secret was one of our take-aways from our visit with the executive director of the 135-year-old, Gilpin Court-based family agency. Friends Association for Children is the poor man's version of Commonwealth Parenting, though the outcomes Friends is able to deliver for its clients are anything but poor. Friends started as an orphanage for African-American children after the Civil War, and now serves 335 preschoolers and adults at three centers -- at Gilpin, in Church Hill and at the Winchester Green development in Chesterfield County. The evolution of the communities that surround the Friends locations has resulted in a shift in their fee-based programs -- only 35% of their constituents come from public housing, and all of the families served by Friends are working families. The Times-Dispatch spent a few column inches on the Greater Richmond Challenge II, a two-day event that sent about 100 Richmonders throughout the region to learn about the challenges and successes in five key areas -- crime, education, affordable housing, workforce development and transportation. The first piece covered the kick-off to Thursday's all-day exploration of the city, and spotlighted two of my favorite Richmonders, PharrOut's Ross Catrow and Hunton & Williams' Robert Grey. Ross Catrow of Richmond said a love for the city drove him to participate. He works for PharrOut, a Web design and development company, and was assigned to one of two teams exploring work-force housing. "There's a lot of potential opportunity for growth in the city," Catrow said. "This is a cool way to learn about important issues and talk to some pretty high-profile people about what people are doing and need to be doing." Working as tag-team motivational speakers yesterday morning, Robert Grey, a partner with the Hunton & Williams law firm, and Andy Stefanovich, in charge of What's Next at innovation consultant Play, were called upon to motivate the crowd to become agents of change for the community. "We are empowering people to become ambassadors for this community, ambassadors for change, ambassadors for involvement, ambassadors for leadership," Grey said. "It's building that asset in this community, about people who want to get engaged, involved and be creative about the solutions." The second piece looked at some of the outcomes of the teams' work, which culminated with a series of presentations to fellow participants and invited guests. "I found more things to love about this town, things we are doing right that I didn't know we are doing," said Gayle Turner. Turner, a lifelong Richmonder and a principal with Beckett Advisors, said he was also inspired by the passion and commitment of his fellow participants. The teams presented their findings yesterday at the Greater Richmond Convention Center through the use of comedic skits, rudimentary props, lots of colored markers and, as moderator Richmond Times-Dispatch Publisher Thomas Silvestri pointed out, without Microsoft PowerPoint. Keith Caleb of Richmond, an electrical planner for DuPont, said his eyes were opened while studying the issue of work-force housing. "I saw what the community can do to change what we have . . . to a nicer community that can support all types of people with all types of needs." Marti Michalec of Wachovia Securities LLC took to heart the theme "to celebrate who we are and insist on more." "We need to share our story and we need to encourage others to get involved," Michalec said. "If everyone gave one hour a week, we could significantly impact the education of our children and our future." This morning, during day two of the Challenge, I encouraged the 90+ participants to develop a few business crushes of their own, and then to pick up the phone or dash off an email to their crushes saying, basically, "I think you are f-ing cool and I want to hang out with you." Most of last year's crushes -- people I didn't know one iota before the Challenge -- have deepened into friendships. Michele Stuchell of C3, Lawson Wijesoorija, Scott Sutton and Robert Dortch have remained on my community radar -- as have (obviously) the Chamber's Stephanie Kirksey and Betsy Mangum (nee Borders). New connections emerged from those relationships -- Don Coleman, Howard Parrish, Jim Thompson, Stephanie Davidson, and others. Robert Grey: Former President of the American Bar Association and Richmond native Robert Grey kicked off the Challenge yesterday morning with Andy Stefanovich of PLAY , and Grey stole the show from the high-energy creative consultant. I've seen Grey speak before, and have always been amazed by his intense passion and eloquence, but he rocked my world yesterday. Why this man is not Mayor or Richmond or Governor of Virginia, I do not know. Before the summer is over, Robert Grey and I are going to have a conversation about that. Tom Silvestri: As publisher of the Richmond Times-Dispatch, Tom probably gets more kicks in the seat than praise, but his passion for community -- for the Richmond community -- absolutely trumps any tooth-gnashing I experience when the paper fails to meet my ridiculous expectations. Plus, he's articulate, quick-thinking and funny. Tom facilitated most of the Challenge's second day, and reminded me why he's always won me over. Buford Scott and the Micah Initiative: I stood on stage before 200 people this afternoon and said, "I fell in love with Buford Scott yesterday." As the President of Scott & Stringfellow, Scott could have turned his back on Richmond's problems and faded into retirement long ago. He didn't. Instead, he's committed himself to the 600 children of Woodville Elementary School near Creighton Court in Richmond's East End -- and committed himself to enlisting 15,000 Richmonders to join him and the Micah Initiative to mentor Richmond's 25,000 schoolchildren. Rosalind Taylor and the staff of Woodville Elementary School: Mrs. Taylor and her team literally brought tears to my eyes with their passion, commitment, rigor and care for their students. She and her team combine love with accountability, measurements with good modeling. The school, which was falling through the floor with its Standards of Learning scores five years ago, scored 98% on the tests last year. The kids in the hallways looked us in the eye and spoke as we passed. The halls were clean. The library was overflowing with books, computers and charm. The passion for learning clung to every surface. Schools like Woodville and principals like Mrs. Taylor make me confident about raising my family in the City of Richmond. TK Somanath: I didn't spend much time with TK this year, but he was an awesome resource last year for those of us on the affordable housing team of the Challenge. He served the same role for this year's affordable housing team. The director of the Better Housing Coalition is pretty easy to love, and he and his team at BHC are turning this region around -- one development at a time. The Greater Richmond Chamber of Commerce staff: Last year, I limited my passion to the few staffers I actually spent time with; things changed this year around. Stephanie Kirksey has assembled a dream team of high-energy, super-smart, passionate people to help shake the dust, tobacco smoke and old bourbon stains off of what was once a stodgy Chamber of Commerce. Three hundred cheers for Stephanie, Sallie Nolte, Stephanie Phillips, Erin Ristau, Debbie Schebe, Betsy Mangum, Manson Boze, Rob Anderson, Andrea Morse and our fearless team leader on the elementary education team, Richard Wintsch. Those guys f-ing rock. Last year, on a bit of a whim, I cajoled my employer to ante up $400 to cover my participation fee for the Greater Richmond Chamber of Commerce's "Greater Richmond Challenge." I had attended the Chamber's Vision 2010 check-up the previous November, and it had piqued my interest with its willingness to invite Richmonders from all walks of life to ask hard questions about the present and paint vivid pictures of the future. I had small hopes that the Challenge might advance the optimism of that half-day event. I also thought I might glean some ideas I could port back to my job in leadership development and training. What I didn't expect was that I would actually get engaged -- almost inspired -- by a two-day experience that took me all over the region exploring the issue of affordable housing. You see, I'd been to a number of these "vision events" over the years, starting in 1990 with VCU's Grace Street Task Force -- a university/community panel that got me extremely excited about the possibilities behind the Grace Street business corridor, and left me (and others involved) deeply disillusioned by the "all talk, no action" approach that ultimately took hold. I sat through visioning events at the University of Richmond, at VCU and at various locations on Broad Street -- enough sessions to develop a rich cynicism about invitations to the public to change their community (not to mention the rich cynicism I developed about comfortable businesspeople -- mostly white, mostly male, mostly wearing blue suits -- looking to assuage their consciences and make a buck on urban development). Lest you think my experience with the Challenge kicked my cynicism in the teeth, let me point you to a recent mostly white, mostly male, mostly blue-suit-wearing event in the Manchester District. Back to the Challenge. It was engaging. It was educational. It was inspiring. I met diverse people who shared a passion for community. It was, basically, many things I had never expected. In the months that followed the Challenge, members of my affordable housing team got back together to learn about Elder Homes, discuss ways we could support the Affordable Housing Trust Fund legislation, and otherwise stay engaged around the issue. We participated in the Richmond Times-Dispatch's Public Square on workforce housing, wrote letters to the editor and volunteered to work on a Habitat for Humanity House. We played a creative role in the Chamber's Vision 2010 check-up event. Who'd've thunk it? Not me. My simple decision to participate in the Challenge introduced me to some very cool people who have remained connected, which essentially is what community building is all about to begin with. When the Chamber's Stephanie Kirksey invited me to participate in the planning committee for the second Greater Richmond Challenge, I couldn't say no. 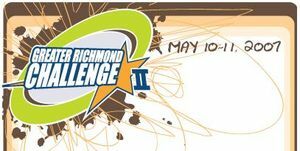 And while my dream of an event that drew 2,000 people together for a week-long engagement never materialized, almost 100 people from all over the Richmond Region will be coming together over the next few weeks for orientation and the 32-hour Challenge event. I'll be writing about the event mostly as a participant, and occasionally from behind-the-scenes. First up -- a meeting with the group of subject-matter experts who will be supporting the ten teams. Although my vision of hundreds of people spilling out of the theater at the Cultural Arts Center at Glen Allen didn't materialize, yesterday's Greater Richmond Chamber of Commerce Vision 20|10 Update drew a respectable 180 participants to focus on the issues of affordable/workforce housing in the Richmond region. And it was further proof that the Chamber -- once the staid bastion of Richmond traditionalism -- has become a dynamic and creative force for conversation in the region. The issue of affordable housing first hit the Chamber's radar this spring, when it pulled together 100+ residents to participate in the Greater Richmond Challenge -- a two-day event that sent teams out into the region to learn about key issues from the people and organizations most actively engaged around them. The affordable housing teams (a total of about 20 people, including me) seemed to hit a chord with our closing presentation at the Challenge. A month after we went back to our lives and the Challenge was set to become another of those "been there, done that" visioning exercises, Stephanie Kirksey of the Chamber invited us back together -- 12 of the original 20 team members came back to the table and agreed to stay engaged around the issue of affordable housing. We had a few simple objectives -- use our experience with the Challenge to build public awareness of the issue of affordable housing in the community; learn more about the Affordable Housing Trust Fund proposal set to go to the General Assembly and decide if we wanted to become advocates for it; find a hands-on project for the team to engage around the subject personally; and look at ways to begin conversations with local politicians and policymakers on solutions to the issue. The Times-Dispatch's Public Square discussion on affordable housing in September went a long way toward meeting our first objective, and set the stage for yesterday's discussion on workforce housing. I got to the Cultural Arts Center earlier than I needed to, and spent some time chatting with Chamber staff (a young, hip and energetic bunch for those readers who had images of doddering men in blue suits) and helping some exhibitors set up tables. Exhibitors included the Better Housing Coalition, East West Partners, ElderHomes Corporation, Habitat for Humanity, Local Initiatives Support Corporation (LISC), Partnership for Workforce Homes and the Virginia Housing Development Authority. Today's Times-Dispatch did an excellent job of summarizing the rest of the morning, which included some local statistics; brief presentations by a local teacher, police officer and former EMT on their personal struggles finding affordable housing; and a panel discussion. The sharp increase in housing prices in the past decade has made homes unaffordable for many working people. "Prices exploded, but incomes did not," said Conrad Egan, president and chief executive of the National Housing Conference, a nonprofit affordable-housing advocacy group. "This has created a gap that is not going to go away by itself." Egan was the keynote speaker yesterday at the Greater Richmond Chamber's conference on work-force housing at The Cultural Arts Center at Glen Allen. He outlined actions local governments can take to increase the supply of affordable housing. Policies should expand the sites on which affordable housing can be built, reduce regulatory barriers, raise more capital for housing and empower residents. Changes in zoning standards that allow denser residential development can jump-start affordable housing and alleviate traffic congestion, Egan said. Elizabeth McLaughlin, chief operating officer of the Southeastern Institute of Research in Richmond, said only 795 houses for sale in the Richmond area are affordable for people with moderate or low incomes. And less than 40 new homes are being built. "This is a growing problem," she said. "Where are we going to be in the next five years if we don't start doing something about it now?" One of the more compelling points was made by Doug Jones of Keystone Builders. Jones showed a slide comparing the cost of building a home in Charlotte-Mecklenburg County (North Carolina) compared to building the same home in Chesterfield County. His company builds starter homes in Charlotte for about $160,000. All things being equal, Jones said, the exact same house in Chesterfield goes on the market for almost $215,000 -- because of zoning requirements, higher proffers and taxes imposed by the county, and sewer requirements. The first Greater Richmond Challenge, organized by the Greater Richmond Chamber of Commerce, could have been a one-cylinder event, another feel-good function that brought citizens together to talk for a day before going back to their lives. Fortunately, so far, that hasn't been the case. Many of the 100+ participants in the two-day exploration of the issues of affordable housing, transportation, crime and safety, education and workforce development are still meeting, and the Chamber has just issued the Greater Richmond Challenge Final Report, collecting the findings from the two-day session. In several weeks, the Richmond Times-Dispatch will hold a Public Square, town hall-style event to discuss the issue of affordable housing (with plans for the other four topics explored in the Challenge to be covered in future Public Square events). And the Chamber meets with some of the participants tomorrow to begin planning for next year's event. Traction is a good thing.